Here is the equivalent plot for Spanish. It’s maximum is lower than English, the maximum is 19 syllables. 444,441 (cuatrocientos cuarenta y cuatro mil cuatrocientos cuarenta y uno) is the first of many numbers with that many syllables. (This assumes that you don’t pronounce the “y”, apparently it merges with the previous vowel). However, it still has a slightly higher average number of syllables when counting to one million. Click here to go to the Spanish counting app. Here is the plot for Chinese. It exhibits much more uniformity than the other two languages (mainly because all of the component number words have 1 syllable, i.e. 1-10,100,1000,10000). You just put them together to make larger and larger numbers. As a result, the maximum number of syllables is only 11! The first number with 11 syllables is 211111 (二十一万一千一百一十一 èr shí yī wàn yī qiān yī bǎi yī shí yī ) and as you’ll see in later plots, almost half of the Chinese numbers between one and one million have 11 syllables. 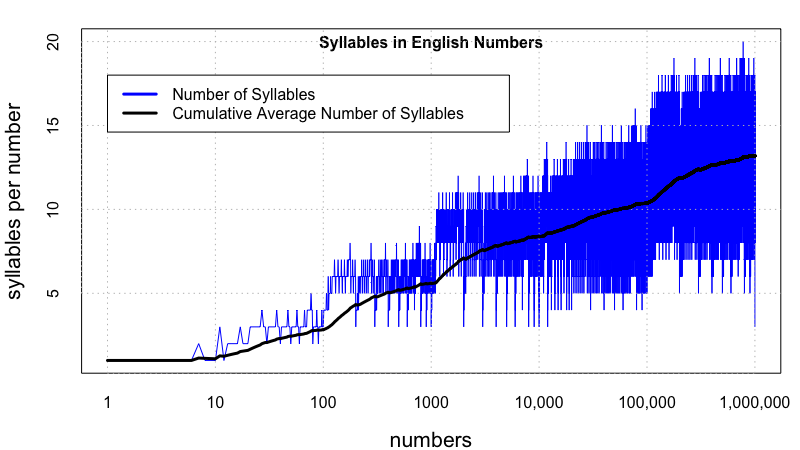 This graph shows the comparison of the cumulative average number of syllables between one to one million. 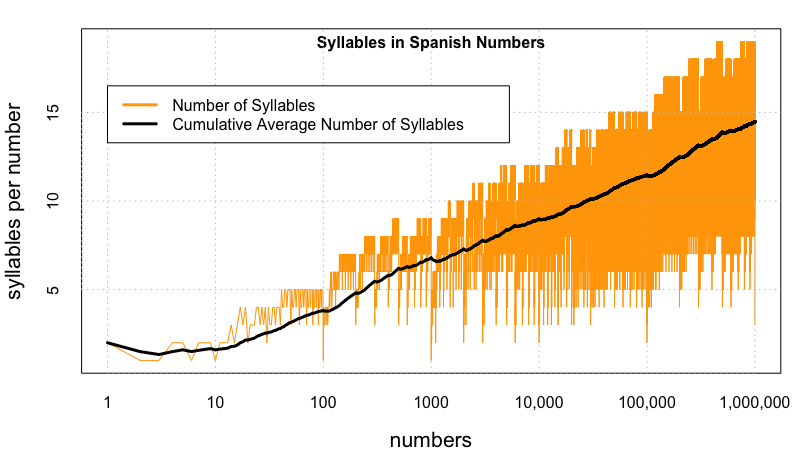 Spanish is consistently higher than the other languages in number of syllables, though only slightly more syllables than English. Chinese, on the other hand, is consistently lower. 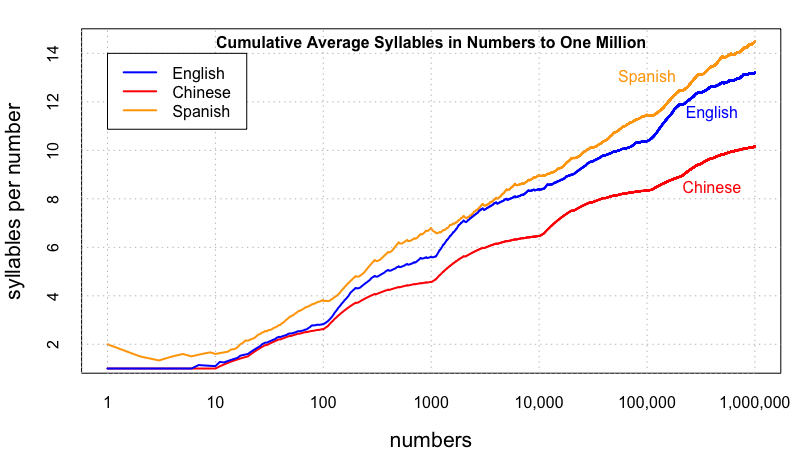 The total number of syllables needed to count to one million in English is 13,198,003; in Spanish it is 14,486,000 1corrected from my earlier calculation of 18.5 million. I’ve been learning lots about Spanish syllables and diphthongs. I had mistakenly said that “siete, nueve, cientos” and other numbers have 3 syllables, whereas they only have 2. Also, I had assumed that the “y” between numbers wass pronounced separately. and only 10,149,985 in Chinese. 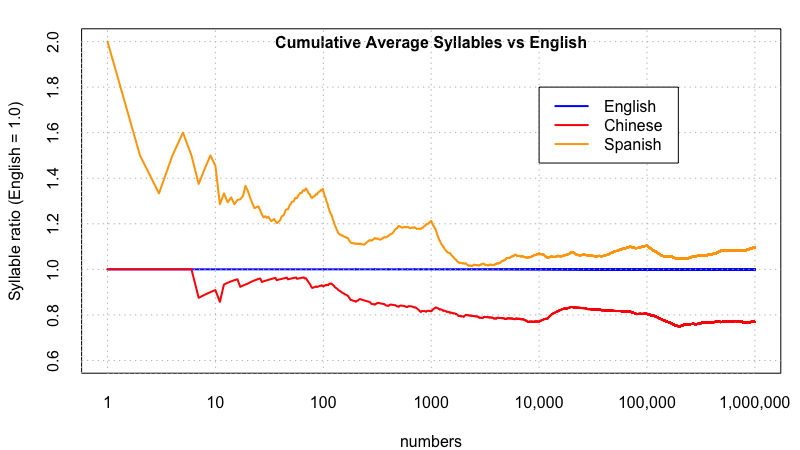 This graph compares Spanish and Chinese to English by dividing the cumulative number of syllables between one and a number in Spanish or Chinese to the same value in English. We can see that if you make it to one million in Spanish, will have spoken about 10% more syllables that you would have in English. But Chinese is a very syllable-efficient language and you’ll have spoken about 20% fewer syllables than English in counting to one million. 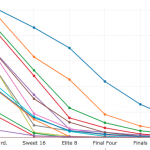 This last graph is a bit more interactive (thankfully) since I’m not plotting 1 million points (or more). 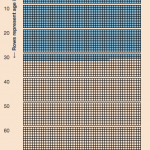 It shows a histogram of the syllables in the numbers up to one million in different languages. 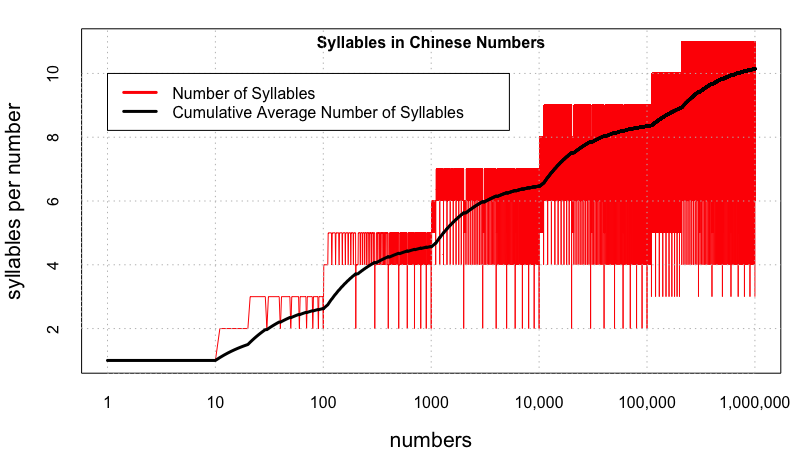 As stated before, nearly half the numbers in Chinese in this range have exactly 11 syllables, whereas the distributions for English and Spanish are shifted towards higher syllable counts and show a broader distributions of syllables. English has a moderately high peak at 14, while Spanish has a broader peak. You can double click on a language in the legend to isolate the distribution for that language or single click to remove that language. I will also be creating the count to one million/billion/trillion calculators for the two additional languages (Spanish and Chinese) as well in the coming days. Update: fixed small issue with Chinese number calculation. Fixed mistaken number of Spanish syllables in seis (1 instead of 2), siete (2 instead of 3), nueve (2 instead of 3), cientos (2 instead of 3), etc. . . Also fixed issue so that “uno” changes to “un” before “millon” and “billon” and “y” is not counted as a syllable. 1. ↑ corrected from my earlier calculation of 18.5 million. I’ve been learning lots about Spanish syllables and diphthongs. I had mistakenly said that “siete, nueve, cientos” and other numbers have 3 syllables, whereas they only have 2. Also, I had assumed that the “y” between numbers wass pronounced separately. For some reason, you only count the diphthongs in the work (as can be seen in the graph of number of syllables counted for the first 10 numbers). 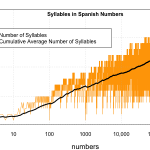 Most probably, Spanish and English have more or less the same number of average syllables per number. Thanks Ivan, a number of other people (on Reddit) have also pointed out my error. The post has been updated and the number of syllables is much lower than before but still about 20% higher than English.